Yay! I get a taco! Does everybody know what day it is? Nope. It’s not Friday. Sorry, Jeni. Nope. It’s not Monday. That was yesterday’s problem. That’s right! It’s Taco Tuesday! Taco Tuesday is on regular rotation at Chez Peady and we always enjoy it. Sometimes the tacos are fancy, with my scrumptious – if I do say so myself – (and I do!) homemade guacamole. Sometimes it’s as basic as following the directions on a taco kit (name brand or otherwise). Sometimes they are filled with beef. Other times it’s chicken. Slow cooked or roasted. Simple and delicious. Even fish tacos are a hit ’round here! We just love tacos. We try to change it up a little bit each time, so that we don’t grow tired of our Taco Tuesday tradition. 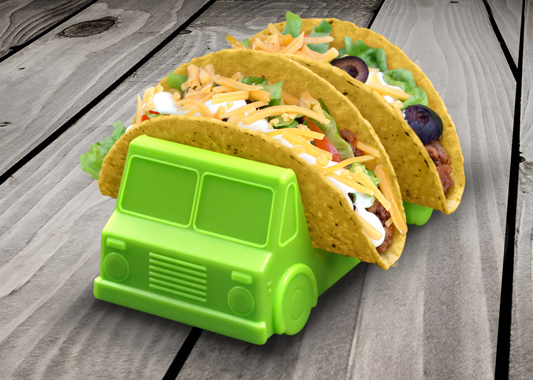 There’re so many ways that a simple meal can be made interesting, and tacos are perfect for customization. From the fillings to the shells, to the toppings and the sauces, there’s a myriad of ways to make tacos – and to make them fun! Tonight’s beef tacos were awesome! Nothing too fancy, but the ingredients were fresh, everyone was looking forward to dinner together, and everything turned out just right. Greek yogurt, taco sauce & fresh, plump, Roma tomatoes. Taco shells. Always heat them like this! Trust me. I think these turned out to be picture perfect. Can you see the nice layers? Can’t you practically taste them? There’s a sad little underripe avocado back there. Thing 2 adding some Greek yogurt to her soft flour tortilla taco. Thing 1 adding spicy taco sauce. The boy was made for spicy! I think next Taco Tuesday we’ll try a vegetarian version made with Chickpeas. I know Thing 1 and Thing 2 will give them a try and very likely will enjoy them. They’ll try anything! They’ve yet to turn up their noses at a single taco trick. From Beer Battered Haddock to Spaghetti*, from beef to books about the topic, I say “Tacos!” and they say “Si!” How lucky are we? *You can find the awesome Taco Truck (and many other examples of awesome) pictured above here. ** Yeah, you read that right. *** My new favourite thing to say. I shared it’s source here.